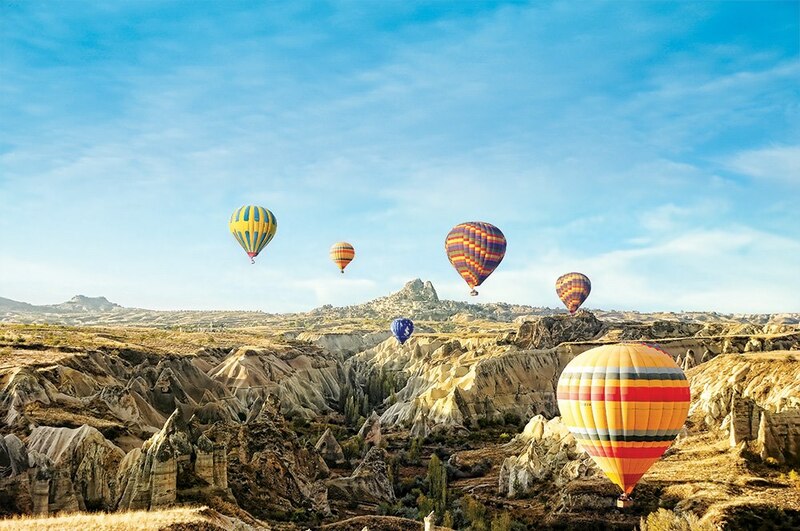 Nothing quite prepares you for Cappadocia. It must be one of the most magical and surreal landscapes in the world. Tall, Dark and Handsome and I had a mind-blowingly, incredible, early morning hot air balloon ride over the enchanted landscape so breakfasted well in preparation at Lil’a Restaurant in the Museum Hotel. We then left ourselves in the capable hands of Emre, our Matiana tour guide for the day. 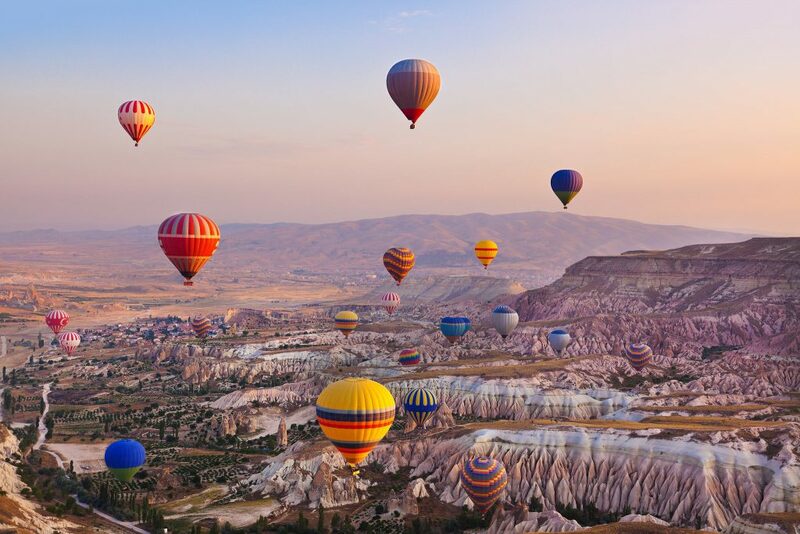 Matiana Travel was established in 1998 in Cappadocia and now has a head office in Istanbul. It is a luxury boutique tour company, designing customised vacations as well as offering day tours, and they pride themselves on using their local knowledge to create bespoke itineraries. Our immaculate driver greeted us warmly and we climbed with Emre into the back of a cool minivan. Trusting Emre and the driver to take us to the best spots, we had given no hint as to what we might like to see during the day; we were excited as Emre outlined his plan for us and started to give us an overview of the area from his clearly encyclopedic (yet never dull) fountain of knowledge. 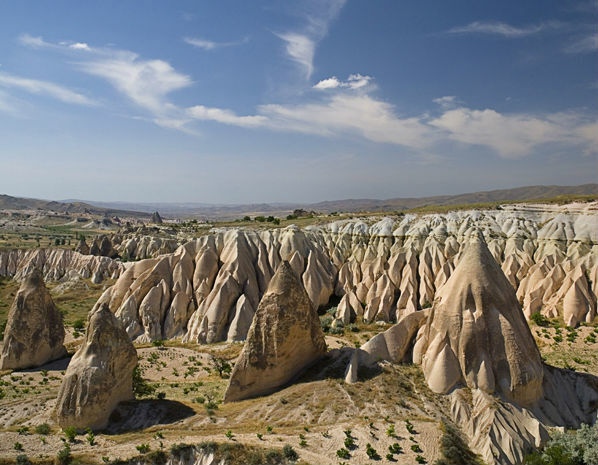 The Cappadocian fairy tale started millions of years ago with active volcanoes pouring out ash that solidified into Tufa, a form of rock. Then wind, rain and the temperature changes started to give shape to the region, which continued to morph and develop over millennia (and still does to this day). The peculiar and desolate landscape must have appeared strange and eerie to the first humans arriving in the area. 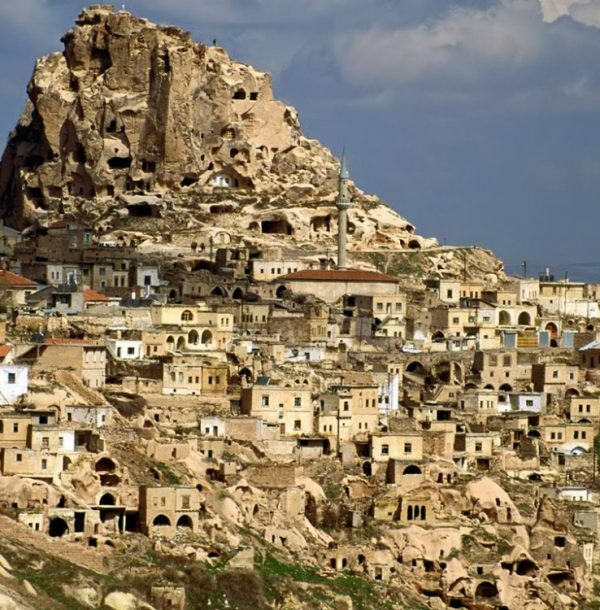 Human habitation, however, has added a spiritual dimension to its history and early settlers left their mark on the landscape with the many dwellings and places of work and worship that were carved into the very rocks that gave Cappadocia its unique aspect. Our first stop on the tour was a wonderful panoramic observation spot where we learned a little more about the geology and history of the area. Esentepe panorama, which translates as ‘windy hill’, has a spectacular view of the former river bed and out across the famous fairy chimneys. Windows of cave houses are visible, and many of the chimneys are inhabited to this day. Emre himself had lived with some friends in one of the fairy chimneys for a number of years; a rather enchanting notion, but cold in the winter, he warned. 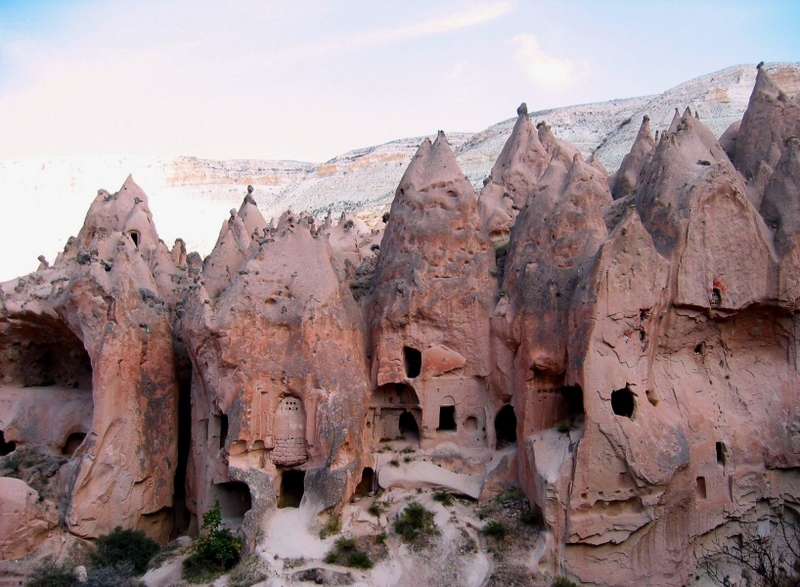 We drove to Göreme, whose name is derived from the Turkish word gorme which means “don’t see”. The English translation could romantically said to be The Invisible City, and there is no doubt that we could never have discovered the hidden beauty that it houses without Emre’s guiding hand and discreetly shared expertise. Many is the tour guide that has brow-beaten me around some of the finest sights of the world; many the time I have wished that there was a volume control or even an “off” button. Not so with Emre, who had the manner of friend casually sharing tips and info with another friend; saying enough to interest and intrigue but never so much as to overload or be boring. Guiding is not just about knowledge, but is also about the sensitive and effective sharing of that knowledge – and Emre had this down to a fine art. 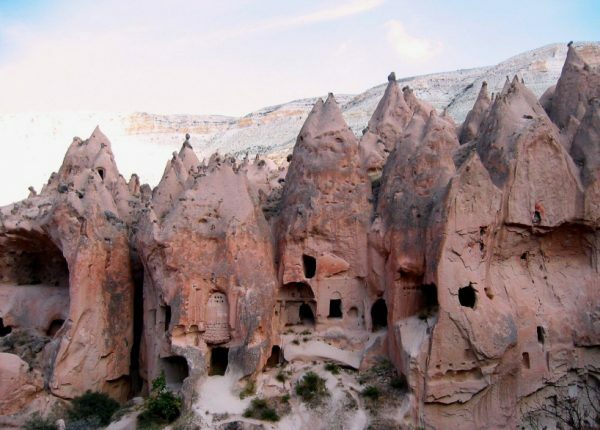 Cappadocia’s most famous attraction is the Göreme Open Air Museum, a vast monastic complex with painted cave churches carved out by Orthodox monks from around 1000 AD. The Museum was added to the UNESCO World Heritage List in 1984 and it was one of the first two UNESCO sites in Turkey. 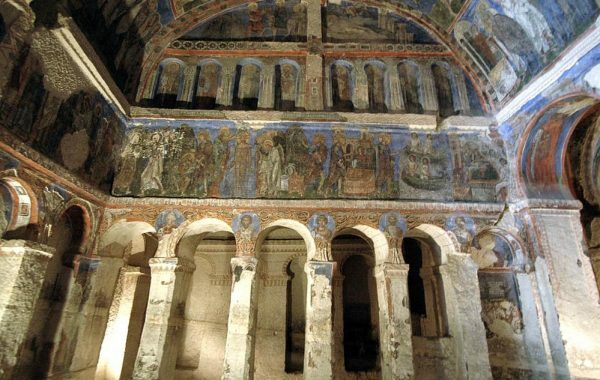 The site holds the region’s best collection of painted cave-churches and the frescos’ colours still retain much of their original freshness (albeit, in some cases having been restored). Emre explained interesting aspects of each cave before we went in then allowed us to explore them at our leisure whilst he waited outside. Expertly unobtrusive, he bought any necessary entrance tickets swiftly and without spectacle, and guided us around in such a way that we avoided all queues and crowds, and felt that we were separate from the tourist treadmill. 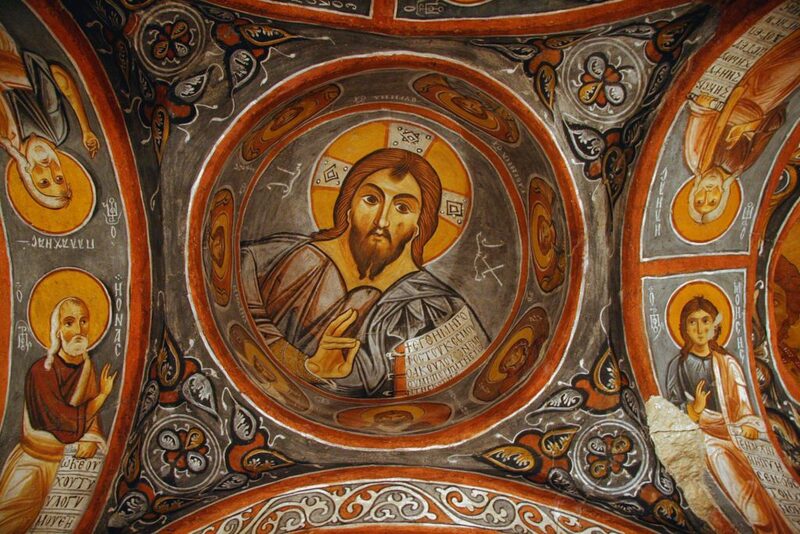 The Byzantine frescos within the caves left me open-mouthed. The caves had been small monastic settlements for both monks and nuns in training. Different caves housed the men’s and women’s dormitories; kitchens were carved out and fire pits created for ovens, the ceilings still visibly blackened from the smoke. Long refectory tables and single-piece benches had been carved into the rocks and cold storage areas were carved into the back of the caves to store fruit and meat the, stone keeping them naturally cool. Stairs are carved to enable access to upper floors, but some access points were even via sheer rocks – with the aid of foot holds and presumably (historically) a rope as well. 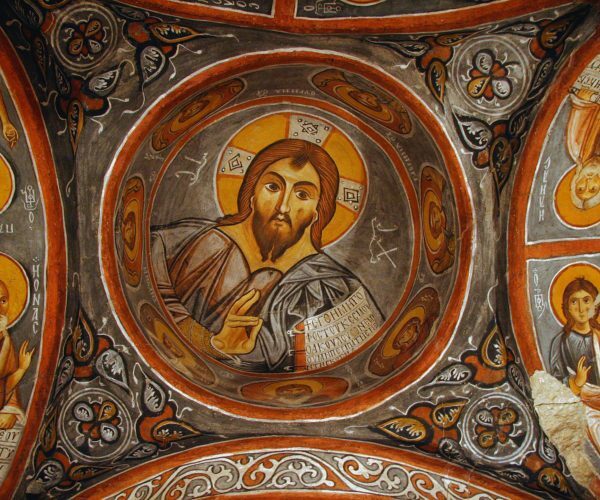 UNESCO restored some of the churches in 1985 as most of the frescos had been damaged by wind, water, earthquakes – and shepherd boys, who sought refuge in the caves and are said to have used the faces in the figures as targets for pebble attacks, having been taught that such images were sinful. However, the beauty of the churches and their decoration still remains. The imagery is Byzantine and for me, as a Byzantine scholar, it was an enormous treat; one highlight coming in The Dark Church, where I came across a truly magnificent depiction of the Last Supper. Outside, young wild donkeys gambolled in the heat around the lunar landscape, seemingly oblivious to the surrounding tourists. Back into our air-conditioned car, the next stop was Avanos. The old city, once called Venessa, overlooks the longest river in Turkey, the Kızılırmak or Red River, which separates Avanos from the rest of Cappadocia. Avanos is famous for the production of earthware pottery, a tradition that it maintains to this day. The ceramic trade in this district and its many pottery factories date back to the Hittites, and the ceramic clay from the red silt of the Kızılırmak has always been used to produce characteristic pieces. We went to cave workshops to see first-hand some of the traditional centuries-old pottery methods, materials and designs that are lovingly maintained to this day. TDH threw a wonderful bowl in red clay, wearing a pair of most fetching (borrowed) floral pyjama bottoms. I fell in love with a $10,000 plate in red, black and white that would look incredible in our country pad in the UK (and may yet return there with us in due course).We finished our Matiana tour with a walk through the fairy chimneys and a visit to the cave dwelling of St Peter. Turkeys and chickens wandered through the dusty landscape and Emre explained that the British had named Turkey, the country, after the bird… a fact that had somehow passed us by, perhaps on the assumption that the reverse had been the case. And this was just one of the dozens of insights with which this expert guide delighted us throughout the day. 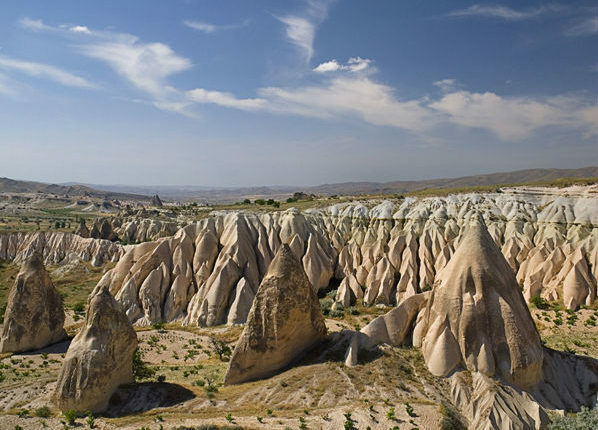 Cappadocia must possess one of the most peculiar and characteristic landscapes in the world: fairytale, strange, and everything I hoped it would be. 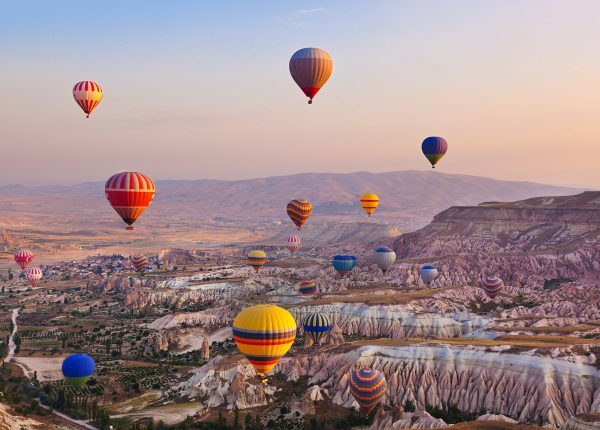 Where else can you waft over fairy chimneys in a hot-air balloon in the morning light and admire underground Byzantine artwork in the afternoon? And what better way to explore and gain insight than with an experienced and dedicated guide, whose gentle and unobtrusive charm matched that of the inspirational surroundings.